Hi everyone. Decided to start documenting whenever we refinish or fix up vintage items for the store or our antique booth. We've been doing it off and on for years, with varied success (our Moreddi coffee table was probably one of the better ones), but it's only now that we have the booth that we've been trying to do more items. I actually already refinished a small Westnofa single nesting table for the booth, but that was in such good shape that it was mostly just teak oil. 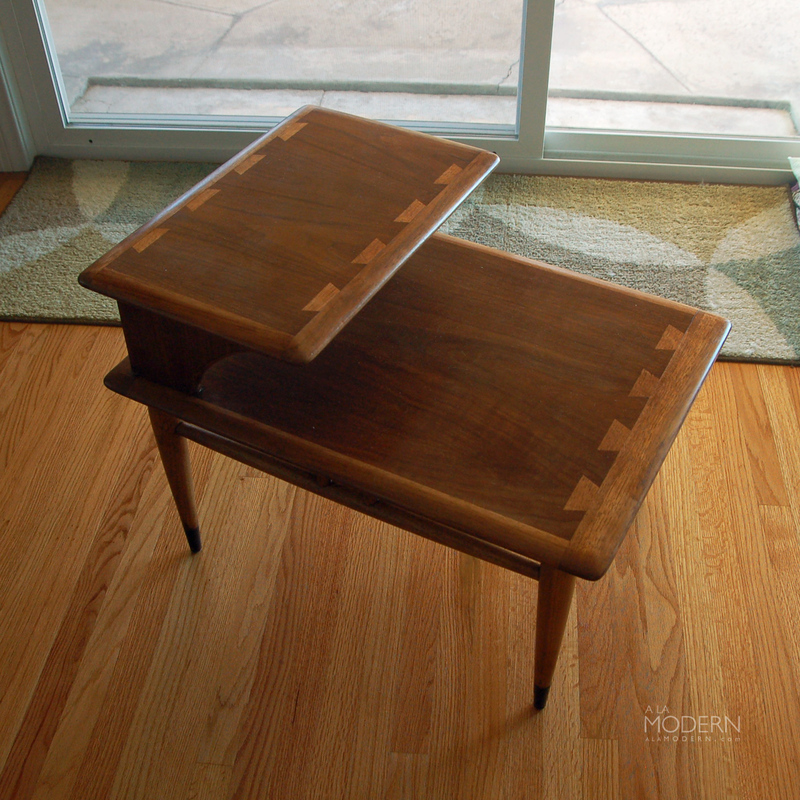 This Lane Acclaim stepped end table was a piece we've had for several years. I'd gotten it originally to try and practice on. The finish was in pretty sorry shape, and the wood was splitting a bit (I ended up not even messing around with tightening up the joints). Sorry, I don't even have a picture of how bad it originally looked. At one point (when we were in the midst of moving) I almost left it on the curb because I thought it was too much trouble to bring along. I've read a few different methods for refinishing Lane Acclaim. The problem for me is the lighter colored dovetails seem to really stand out too much when this stuff is refinished. I mean, I'm not too particular about refinishing - I know a lot of people are super particular about getting it back into exactly the state it was when it was new. Me, I'm sorta ehh... but yeah the super light dovetails bother me. I think some people actually like it, though. So I decided to try use a more darker red colored stain - someone suggested Minwax Gel Stain in Cherrywood, so I bought a can of that. The hardest thing was actually getting the finish off to start with. I was going to sand the whole thing down, but I heard that the veneer is thin, so I used some Circa 1890 Paint stripper instead. That didn't seem to work very well, so I switched to Citristrip and it went much easier (and safer - geez that paint stripper burns!) I used some 0000 steel wool after that as well. I think next time I might try wiping it down with mineral spirits too afterwards. Also, one thing that was lucky was that the black painted ferrule feet were still in good shape so didn't have to mess around with that. Just taped it up. After the finish was mostly off, I used that Minwax gel stain... I have to say that I liked the color on it, but I didn't like the way it dried so fast and streaked so much. Maybe it was because I just wasn't used to applying it, plus it was like 90 degrees out. I wasn't able to put on a full coat before it had dried already on one side. I even got some finger prints in it on accident. I did like that you could apply it with a rag instead of painting it on. It came out OK, but streaky. I did two coats of that to get the color the way I wanted. I was going to sand in-between coats, but the directions said specifically not too... so I didn't. I'm wondering a little about that. I know you're supposed to put lacquer or polyurathane on afterwards - but I decided not to - yet, at least. I'd actually picked up a small can of Minwax Polyurathane in Satin to try it. I might still do it. Have also heard of poly that you can just wipe on. That actually seems better option, rather than spray or painting it on. Overall, it came out OK. I think it'll be fine for the booth. If I ever try refinish this line again, I might try and not strip the finish if it's not too damaged and just sand it down some and then apply stain. I'm not too familiar with the different type of stains - but next time I'd like to get one that doesn't dry so darned fast.